There are no difficulties in installing the application from the Google Play, but sometimes it is a real headache. One day you can notice an unknown error code 24 in Play Store during downloading or installation of the app. 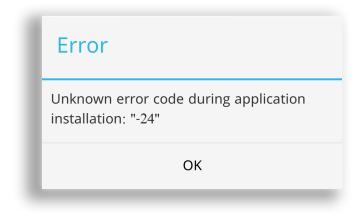 Let’s discuss this problem, that you can face with and find out what is error code 24 in the Android Google Play and what to do for troubleshooting error code 24. I tried to install one application from Google Play, which I removed from my tablet a few months ago. Suddenly, the message: Unknown error code during application installation: “-24”, had appeared on my screen. First, I started panicking because of error code 24 on Play Store, and all my thoughts were about “oh, my god, I broke my tablet!”. Don’t do that, it makes no sense. It is much easier to solve error code 24 on Google Play Store without root rights or manual manipulations. You just need to install cleaning programs like SD Maid or Cleanmaster and clean your device to fix error code 24 in Google Play. In the cleaning program you can choose some tools to fix a lot of errors. Cleaning empty folders is one of the solutions how to fix error code 24 on Android. After that in the ROOT Manager open hidden folders data/data and sdcard/Android/data/data. There you need to find a folder of the application, that you can’t install because of error code 24 Android. To fix the error, simply delete the folder with the name of the problem application. Feel free to ask any question about the Error 24 in the Play Market.